New research by American University Kogod School of Business professor finds that cases involving whistleblowers result in greater penalties, enforcement. Promoting and maintaining financial fraud whistleblower programs, such as those of the Securities and Exchange Commission (SEC) and the Commodity Futures Trading Commission (CFTC), is costly. Cases involving whistleblowers require significant resources as they take nearly 10 months longer to complete. 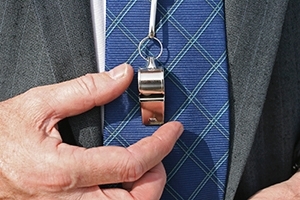 Rewards for whistleblowers who come forward with original information leading to an enforcement action can be large, ranging from 10% to 30% of monetary sanctions over $1 million. This past September, the SEC awarded $30 million to a whistleblower—it's largest award yet. But according to a new study coauthored by Gerald S. Martin, professor of finance at American University's Kogod School of Business, the benefits of whistleblower programs outweigh the costs as whistleblower involvement helps the SEC and Department of Justice (DOJ) build stronger cases against firms and executives accused of financial misrepresentation. The study, titled "The Impact of Whistleblowers on Financial Misrepresentation Enforcement Actions," found that on average, firm penalties associated with whistleblower involvement are $92.88 million more than when no whistleblower is involved. Executives and employees at firms with whistleblower involvement are fined on average $56.50 million more and are sentenced to prison for approximately 27 months longer. To conduct the study, Martin and his fellow researchers from the University of Iowa, Arizona State University, and Texas A&M University obtained a dataset of employee whistleblowing allegations through a Freedom of Information Act filing. The researchers merged this dataset with a comprehensive database of financial misrepresentation enforcement actions under Section 13(b) of the Securities Exchange Act created by the 1977 Foreign Corrupt Practices Act. The researchers estimate whistleblowers enabled regulators to successfully obtain additional judgments of $21.27 billion more than would have been obtained without their assistance. This increase in penalties accounts for 30% of the total $70.13 billion penalties assessed over the 35 year sample period from 1978 to 2012. Until now, research about the impact whistleblowers have on enforcement outcomes has been limited, yet policymakers continue to push for increased rewards for whistleblowers without regard to the economic benefits of doing so. "Last month U.S. Attorney General Eric Holder called on Congress to increase rewards for whistleblowers to improve the DOJ's ability to conduct investigations and stop Wall Street misconduct," Martin said, citing a recent example. "This study provides the necessary evidence to inform policymakers on the ongoing debate about the efficacy of whistleblower programs and supports the increase of whistleblower incentive programs."